Lemonade Mouth Puckers Up by Mark Peter Hughes. Sequel to Lemonade Mouth. Review: Drama and heartbreak is what you will read in Lemonade Mouth Puckers Up. Have you ever heard the saying "get your story straight?" Well, you will hear it in this book Lemonade Mouth Puckers Up by Mark Peter Hughes. In this story perspective is the key. Imagine your life as a pop star! Dancing, lights, cameras, cover of magazines anything you can name. But imagine during a normal boring summer day the next day you would be famous. Well, in the story Lemonade Mouth Puckers Up it would happen to 5 teens Wen, Mo, Stella, Charlie, and Olivia. The biggest music director listens the Lemonade Mouth (the band name) and he loves it. He also talks about getting them a record label and everyone agrees. What the kids didn't know was they had to impress millions upon millions of fans waiting for them to sing on American Idol. Also, the book isn't just about music, its about drama/ heartbreaks too. A visitor comes from India and literally every girl in the book likes him and fight over himÉ who do you think will get him? Wen, Stella, or Olivia you will just have to read to find out. I personally thought Lemonade Mouth wasn't the kind of book that would suit a person like me. But if you like a good drama, and a hip hop book then Lemonade Mouth is the book for you! I also think that Lemonade Mouth is good for young kids who love music because it has more of a hip hop flare to it with their band in the book. Lastly, another reason Lemonade Mouth is a good book is because the way the story is written is Phenomenal. For instance, it gives detail, and each person's speech and also it gives multiple opinions/ perspectives when something happens in the story. Review written by Anish (6th grade student). We would like to thank Random House for providing a copy of Lemonade Mouth Puckers Up for this review. 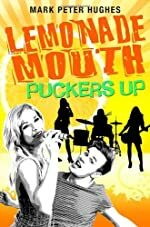 Have you read Lemonade Mouth Puckers Up? How would you rate it?